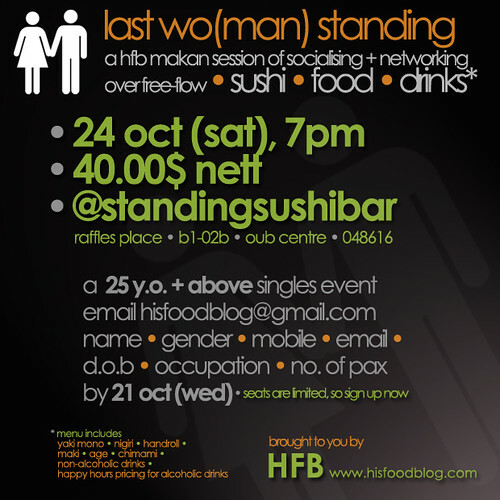 Join us as you step out of your comfort zone and mingle with the rest of the single foodies, who are equally fun and sociable at the Standing Sushi Bar on a lovely Saturday evening on 24 Oct.
What’s more, there’s going to be free-flow of delectable Japanese food at an attractive price of $40 nett, (think Sushi Nigiri, Handroll, Maki, etc) coupled with a conducive interacting environment and booze at Happy Hour prices throughout the event (disclaimer: if you drink, do not drive). However, do note that this is a 25 y.o and above event, and you do need to furbish your name, gender, mobile, email, date of birth, occupation and no. of pax (do provide corresponding information of your friends too) to hisfoodblog@gmail.com no later than 21 Oct (Wed). Seats are limited so do register early to confirm your places today! can we just sign up to eat as much sushi as we want for $40? Technically, that is a yes - but, that would mean you miss the bigger picture of the event - which of course is to encourage singles to mingle and network over food. but...why 25 y.o? i'm 24 but interested to join...no? Well, no good reason really. Heh - just something we decided to work with since its catered mainly for the working professionals. Are you working or studying? If you are working, I wouldn't mind making an exception just for you.